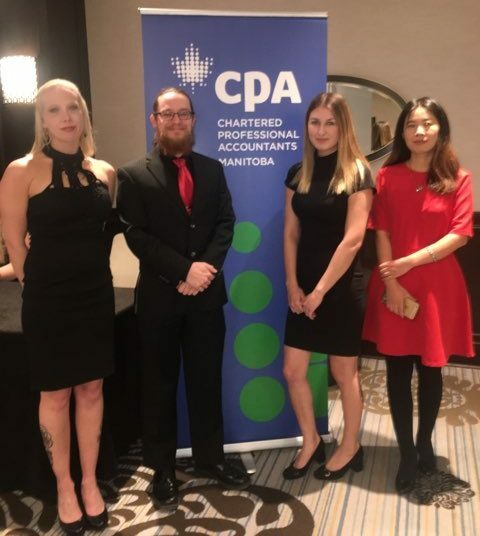 The Brandon University team of Meagan Wruth (from left to right), Cale Lewis, Kyla Menard and Yojie Hou won the Business and Accounting Students Case Competition in Winnipeg. BRANDON – As the Winter Term winds down at Brandon University (BU) a group of students from the Business Administration program can look back with pride. 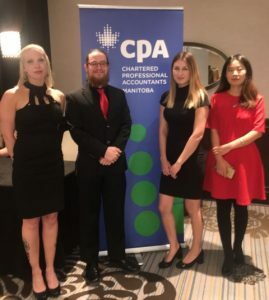 Yojie Hou, Cale Lewis, Kyla Menard and Meagan Wruth formed the BU team that won the Business and Accounting Students Case (BASC) Competition hosted by the Asper School of Business Accounting Association in January. Each student team was presented with a case that focused on whether or not a prospective customer should receive a loan. Given 2 ½ hours to read and evaluate the case, the teams then gave their analysis and recommendations to a panel during a 20-minute presentation. The presentations were followed by a five-minute discussion period. Four teams advanced to the final round of evaluation, with the BU entry then declared the winner of the BASC.